Squirrels are always on the go, so they couldn’t care less about stopping to use the potty. Squirrels’ can’t-stop, won’t-stop energy makes potty time a real adventure. They’re not likely to stop playing long enough to use the potty. This personality doesn’t seem to be bothered by a full load in their pants, because they’re too busy to notice. Skip the Finer Details : Your squirrel doesn’t have the patience to sit and listen to all the details of the potty process, so don’t bore her with instruction. Game On : Get him started on games and the Time to Potty app, and combine the games with real potty experiences. 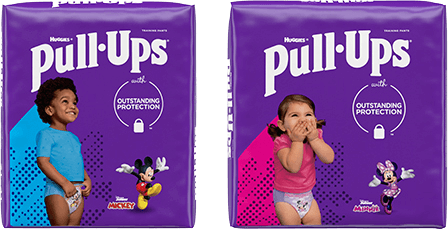 Quicken the Process with Pull-Ups® : Let your Squirrel know that consistently using Pull-Ups® is faster than using diapers – which means playtime starts even sooner! All of the Feelings : Make sure your Squirrel is aware of her own body. Ask her what she feels like when she has to go potty. Just remember that toddlers sometimes have a hard time putting their feelings and sensations into words, so you can also share what it feels like when you have to go. Don’t Stop Moving : Keep him moving when possible. Squirrels need tons of exercise and play time to they can later settle down to their potty business. We’ve also compiled some essential reading that will help you and your Squirrel train together.